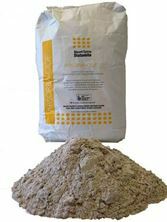 Designed and trialed at the Agvention centre in Kandanga the BOS BAG is a simple, chemical free and effective means of treating your cattle with non-residual fly control products. 4. To fill the BOS BAG, open the Velcro end and pour approximately half the powder bag contents carefully into the opening. Try not to get dust into the Velcro as it will affect performance of the Velcro. Don’t overfill. 5. Hang the bag in a high traffic area of the paddock with its base height a few inches below the height of the shoulder of the smallest target animals. If you are feeding lick (such as sulphur) for an integrated approach to parasite control, you may choose to place bag over lick feeding area, near entries to water or at a high-traffic shade camp area. 6. After a week, usually most animals know what the bag is for and an effect should be seen. Move the bag with the cattle if necessary and over time the cattle will seek out the bags so placement becomes less important. Dust use by bulls is usually much higher than other classes of cattle. Buy the set and save! 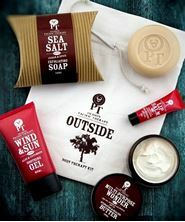 Includes Sea Salt Soap, Lip Balm, Wonder Butter, Sun & Wind Soothing Gel all presented in a calico giftbag.